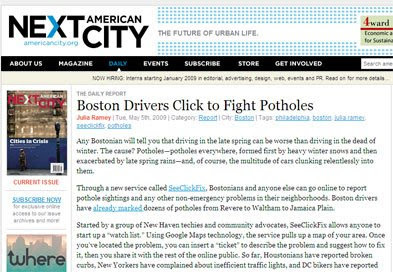 The Miami Herald is Launching SeeClickFix in their site. The Herald created a watch area for the Department of Public Works in Coral Gables, Fla and is embedding SeeClickFix in their site. We are excited to see SeeClickFix get started in this part of Florida as there is already a very active Florida Department of Transportation Fixer who is not only responding to issues related to her department but also forwarding issues they are not responsible onto others responsible for the public space. Gables Public Works Director Alberto Delgado said he welcomed comments and input from residents. ''This makes it easier for us to know about situations out there that we may not be immediately aware of,'' Delgado said. Rick Hirsch, senior editor for multimedia at The Herald, said the paper was starting the pilot program in Coral Gables and plans to expand to other cities. ''This is a great tool for community residents and local government to use digital tools to solve the annoying headaches of urban life,'' Hirsch said. ''It gives citizens the power to point out problems quickly and without a bunch of phone calls, forms or red tape. And it enables people in government to fix small problems quickly with taxpayers as their eyes and ears,'' Hirsch said. To see all the clickets that Houston PWE employees have created. No one can say these inspectors aren't doing their job. This is part of a pilot program that the city of Houston's Public Works and Engineering department is running. The City of Houston was excited about SeeClickFix because their inspectors can easily report Clickets right from their Blackberry. As of now they have signed up for 100 SeeClickFix Pro Accounts for their inspectors so they can keep track who's reporting what. A friend of ours at Mixed Ink, David Sterne, Gave us the heads up that a reporter for the Oakland Tribune was trying to use a new platform called Spot.Us to pitch a story about the poor state of roads in Oakland, CA. Spot.US is a site where the community raises monies to pay the journalist and the newspaper agrees to publish the article if the bounty is achieved . Shortly after the money was raised in preparation for the story David Cohn and spot.us led the We Hella Hate Potholes ride. They used a SeeClickFix map embedded in the Oakland Tribune to document the potholes. Cohn, says of his conversation with an assistant suoervisor at Oakland DPW, " I guided him through both Web sites (seeclickfix and the oakland tribune) and he was completely taken aback, both in awe and simple surprise, that this information was out there. “Wow, we could really use this"
Look out for the story by Sean Maher in the Oakland Tribune. Town of Ayer Mass embeds SeeClickFix map for reporting issues to city hall. We got a nice email from the town of Ayer Mass. today letting us know that they embedded our free widget in their city hall website to encourage users to report non-emegency issues to them. On the page they state, Please note that clicking and identifying a repair does not always mean we (the DPW) can fix that particular problem due to jurisdiction, budgets constraints, and other concerns, however alerting us to an issue will allow us to prioritize and escalate repairs, and also be knowledgeable about community needs and concerns. We love this statement and believe this is the exact approach that a city hall should take when addressing their citizens needs. On May 5th Fred Wilson Posted an article on his blog avc.com which suggested that it would be great if you could use twitter to report issues like potholes that would typically be reported to city hall via 311. Fred notes that documenting typical 311 issues in this way would be beneficial because of the addition of a photo amongst other things. He also notes that there would be added benefit if the community could comment on the issue and increase its priority relative to the amount of people concerned about the issue. A new SideClick in Hartford just let us know about this SeeClickFix story on one of their local TV stations. Speeding, Potholes and Drug Dealing were amongst the issues discussed in the story. Lt. Joe Witkowski said in the story "It's quality of life, neighborhood issues, it's housing, law enforcement related, everything,"
The Clickets are starting to come in around the Hartford area and local governments in West Hartford, East Hartford and Hartford are responding to Clickets reported with Work Order numbers. It will be exciting to see how the clicking and fixing progresses there. Fred Wilson mentions SeeClickFix in disruption talk at google. Fred Wilson, NYC VC and AVC.Com blogger, mentions SeeClickFix in disruption talk at Google this week. There have been a number of complaints on SeeClickFix about speeding school buses and dangerously parked school buses. Speeding is difficult to document, but if you're creative a video camera will go a long way. Fun Stuff. The Clickers never cease to surprise us. We were excited to see that these guys recognized that while potholes are a big use of the site there are many diverse issues such as bike lanes needed and other pieces of broken infrastructure being reported all over the country. In speaking to a crowd at the Web 2.0 conference in San Francisco Andrew McLaughlin of Google said Gov 2.0 is the ability to “apply consumer-type technologies to government so that it’s more transparent, participatory, collaborative, effective and efficient”. If you've looked below the funny looking stick figures on our welcome page you'll notice the SeeClickFix mission: "SeeClickFix provides tools that increase transparency and communication between residents, governments and organizations anywhere in the world. Our goal is to make it easier to improve your community." Is SeeClickFix the incarnation of Gov2.0? Andrew thinks its one of them. In his speech he went on to mention 4 examples where Gov 2.0 is already working and SeeClickFix was in the mix. As the SeeClickFix user who has done a litter clean-up, removed graffiti or pulled an abandoned boat out of a park knows SeeClickFix is not just gov 2.0 its COMMUNITY 2.0. We're excited to see that government is establishing their place in that community and we are grateful to guys like Andrew who are putting SeeClickFix in the spotlight. 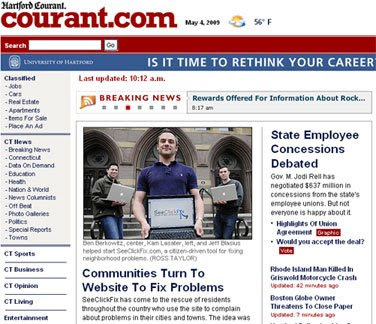 http://Lohud.com and http://www.larchmontgazette.com/ launched SeeClickFix.com in their sites today. Lohud is using the SeeClickFix widget to document potholes in the Lower Hudson region. Larchmont Gazette has purchased a SeeClickFix Pro account so they are capabale of only displaying issues that they acknowledge with their SCF Pro Log-In. The latter is a new and interesting approach to SeeClickFix and Journalism. The paper itself is passing issues to the right towns and departments based on their knowledge of who's responsible while only giving publicity on their site to those issues which they acknowledge. It will be interesting to watch this hands-on approach unfold in a small community like Larchmont. This is from A Hartford Courant Story in today's paper. ...Whenever a ticket is formed in that watch area, everyone on the e-mail list gets notified. That's how New Haven Police Chief James Lewis first heard about SeeClickFix. He was receiving e-mails about watch areas at all times of the day and night, prompting him to call the SeeClickFix team to give a demonstration to the lieutenants of the city's 10 policing districts. Now, they're all using SeeClickFix, which helped in the recent heroin bust, Lewis said. "I think this is true community policing. The community is talking directly to us. When we do respond, we send them feedback with what we've done," Lewis said. He called it a cost-effective tool because it helps city departments and residents and is free. "I think it's the tool of the future," Lewis said. New Haven Mayor John DeStefano also is praising SeeClickFix. "SeeClickFix has turned out to be a powerful, citizen-driven tool to help get neighborhood problems seen and fixed. We got introduced to it almost a year ago and decided from the outset to make sure our agency directors routinely scanned the SeeClickFix site," DeStefano said. "What I like best about it is it's a vibrant sign of neighborhoods taking ownership." SeeClickFix was invited to Ms. Berkowitz's Class in Brooklyn to talk about SeeClickFix and do some seeing and clicking with the kids. The kids told me how Marty Markowitz was the Borough President in Brooklyn and I explained to them that that meant that Marty worked for them and we should tell Marty about the things they wanted him to help fix. We created a watch area for Mr. Markowitz so that when the kids and other Brooklynites reported issues he would be alerted. Before I arrived the kids had gone out and documented the things they wanted fixed and how they might fix them and why they should be fixed. Some kids suggested that construction workers could fix the problem or Marty Markowitz could fix them or they could call 311 or as prompted: seeclickfix. Also in true SeeClickFix spirit the kids said that they could tell people not to litter or ask them to pick-up after their dogs. We proceeded to document some of the issues and I hear that a few of the kids went home and reported more issues. All and all it was great to see kids take such and active caring role in the outside space around them. More classrooms to come? We hope so.